Didn’t that feel wonderful? 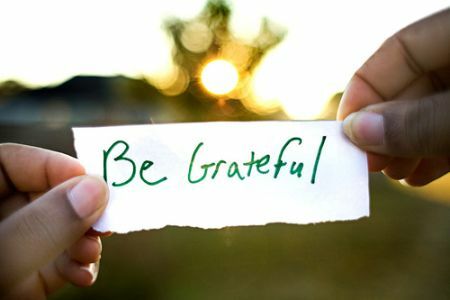 Gratefulness is the reason for the season, and science has shown that a consistent gratitude practice can change the trajectory of your day and the course of your life! While we’re tackling your most pressing holiday questions and talkin’ feasting in today’s blog, we’re also focusing on the real reason for the season. Besides, everything tastes better with a heaping side of thankfulness! Question #1: “How do I deal with all the questions I’ll get from my family and friends when I show up as a vegan on the most food-focused holiday of the year? This is a common conundrum at the GetVegucated Schoolhouse Online Community, and it’s one with a response that you can refine and perfect over time. For starters, offer to bring your own food. That way, you can eat, drink and be merry and be considerate of your host, while also showing your pals how delicious the vegan lifestyle is! Gobble Day is an excellent opportunity to BLOW PEOPLE AWAY with your delicious food. There are amazing recipes for cruelty-free main dishes. Whether you’re the chef, a dish-toting attendee, or a grab-and-go partygoer, the suggestions below will make you the most popular person at the gathering! In addition to the recipes above, we HIGHLY recommend Vegan Holiday Cooking from Candle Cafe, an incredible resource, holiday gift option and opportunity to recreate Candle Cafe‘s magical dining experience in the comfort of your own home! We interviewed co-author Joy Pierson on our website. Another culinary staple of the holiday season is Nava Atlas’s Vegan Holiday Kitchen: More than 200 Delicious, Festive Recipes for Special Occasions! Sponsor a Turkey: On a holiday where 45 million sensitive and inquisitive turkeys are slaughtered just to fill our plates, it’s a pretty great time to sponsor a gobbler and save a life. 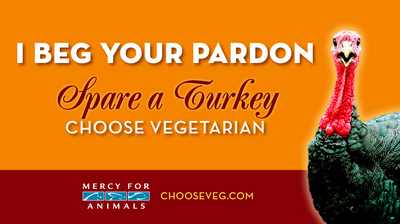 Farm Sanctuary has a wonderful “Adopt a Turkey” Project that aims to generate support for the Sanctuary’s many rescued turkeys. Do For Others: Nothing gets us feeling more grateful than doing good deeds for those less fortunate! Volunteer with Food Not Bombs to serve nutritious vegan meals to the homeless, donate a warm coat to someone sleeping outside, walk (or sing to – just sayin’) animals in your local shelter, visit with or invite a lonely senior to your meal, give one of the 400,000 children in foster care a memorable gift (November is National Adoption Month, after all). The point is – every little bit matters and means something BIG to someone. The options are really limitless! We’re sending warm holiday wishes and heaps of moral support to all of you compassionate cuisine connoisseurs out there! 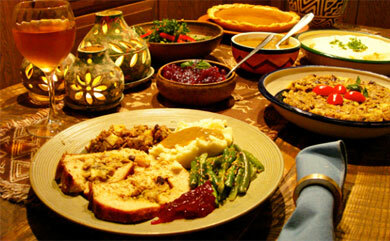 Have a gratitude-rich Thanksliving abounding with sharing, caring and enlightened eats.